The monkeys at Londolozi have luxury tastes. As I sit on my treetop balcony a vervet monkey takes her baby for a swim in my private plunge pool. I reach for my camera and she turns her velvet-black face ringed with silver fur towards me; 'no paparazzi' her expression seems to say. It is clear from the indifference with which she regards me that it is in fact HER private plunge pool, for I am merely passing through and she lives here. This unbeatable combination of luxury and wildlife is what Londolozi private game reserve is famous for. The Varty family believe in 'spirit of place' and have a deep feeling of responsibility for the land they share a history with and the animals that inhabit it. The name Londolozi means 'protector of all living things. This is a very special place to visit. There is a sense of 'family' amongst the staff and you get the impression those who live here love this land with a passion that goes deep. Londolozi sits lightly on the banks of the Sand River in the heart of the Sabi Sand Reserve adjoining Kruger National Park in Mpumalana. There are no fences and animals move freely wherever they wish, so you see a great variety of game. The leopards of Londolozi are justly famous: twenty five years of observation has meant that generations of these elusive cats are more at ease with 4WDs, which means you get a chance to get close to some of Africa's most private animals. On our first game drive we have spots before our eyes almost immediately when our tracker sees a leopard sitting basking on a rock, her eyes ginger in the sun. That same day we also see lions on the prowl, delicate impala aplenty and are even mock-charged by a rhino that thinks we're a little too interested in his family group. Anyone visiting Londolozi should request a drive in their new zero admissions electric game drive vehicle with significantly lower carbon footprint than the conventional 4WD and the first of is kind. For viewers it has the advantage of being silent, so animals are disturbed even less. Back at Tree Camp that night the bush decks are lit up with Out-Of-Africa style hurricane lamps. Tree Camp is my personal favourite; it has six suites with wide windows out onto bush views, open air decks nestling in the ebony trees and outdoor plunge pools. Marry all this closeness to nature with the Ralph Lauren wallpaper, chocolate leather sofas, cream furnishings and that ultimate indulgence, a freestanding stone bath looking out into the bush, and you have the perfect combination of style and simplicity. Pioneer Camp's three suites are the most historical as it was on this site eighty years ago that the Varty and Taylor ancestors first pitched their tents. In honour of that fact guest suites are themed with historic memorabilia, there is a quintessential Englishness about the elegant cream interiors, silver teapots and Portmeirion crockery. The other historic camp - Founders Camp is child friendly and offers families the chance to safari in classic style with old military chests, leather sofas and more classic safari lamps. Children are also welcome at Varty Camp, where all ten chalets have their own private swimming pools, perfect after a dusty day in the bush. At the heart of Londolozi, Varty is where you'll also find the library and massage room. The newest and most exclusive addition are the three Granite Suites surrounded by riverine forest river and decorated in a pallet of colours all the best rhinos have been wearing for years; charcoal, grey and slate. At day's end I wander down to the restaurant deck where I swear the same monkey that invaded my plunge pool, her baby and several of her troublesome relations are now hovering in the trees. As the elephant-grey dusk descends we sit sipping champagne and listening to the sounds of the African night. 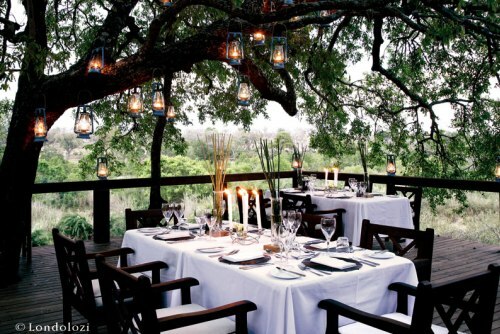 Check in: Londolozi, Sabi Sands Reserve, South Africa. Tel: +27 11 280 6655 Fax: +27 11 280 6656. Ultimate Luxury: Sunset gin and tonics with the roar of lions in the distance. Most Indulgent Moment: Early morning yoga at the Wellness centre with the sounds of the bush waking up. The Little Things: All the staff are incredibly friendly and helpful. Junior Luxies: The cubs programme is for kids of all ages. Children welcome at the Varty and Founders camps. Dress code: Khaki shirts, chinos (that have seen more than one safari before). Perfect luggage: Mulholland leather Hippo Duffel (the name seems appropriate).